These easy and inexpensive Dr. Seuss festive paper party lights are the perfect way to get your space in a Seuss themed mood! 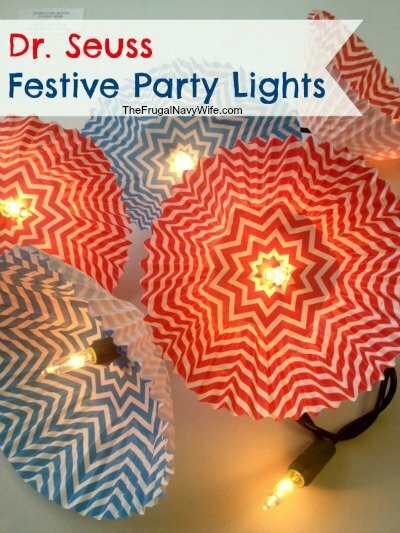 Made from a few common craft store materials, these lights can really “light” up your party in a way that is frugal and fun. They only take seconds to make, so take a look below to see how you can craft your own. We found the cupcake cups used in our sample photo at Hobby Lobby. They were sold in a package together for just $2. Now that is a bargain. Twinkle lights such as the ones used here can be found at your local dollar store or craft store for around $1. 1. Begin by taking a pencil and making a hole in the very center of each cup. 2. Fold each cup inside out. That way the design will be on the inside of the cup and be able to be seen easily. 3. Press each cup over a bulb on the strand. The bulb should go right through the hole you created earlier. 4. If the cup feels loose, just pinch it a little around the bulb to secure it. Now all you need to do is hang your lights where you see fit and plug them in. They will glow and reflect off of the colors of the cups and create some real Seuss like fun. As you can see, these Seuss party lights are easy to make, easy to hang, and even more easy to enjoy. Head to your local craft store and grab some cupcake cups for yourself so you can give these party lights a try. They are sure to add some Seuss fun to your space!